When Gaby put out the latest #2014BloggerChallenge prompt; high end vs high street, I knew exactly where I wanted to go with this! I've been scrolling around the internet like a kid in a candy shop with a platinum AMEX eyeing up all of the over priced beauty luxuries I can only dream of taking home with me one day. That day doesn't look like it's going to come any time soon (though I might go and put the lottery on tonight just incase!) but it's always fun to window shop...right? So let's jump right in and take a peek at the products making me drool all over my keyboard! I still have yet to purchase anything Nars but if I had my way, this palette would break my Nars-ginity! I'm a neutrals girl and a sucker for pretty palettes - and just look at this beauty! I love the pigmentation in Nars products and this palette is so versatile for day and night, it'd create numerous awesome looks. I used a sample of this a while ago and fell head over heels in love with it. I'm pretty sure they discontinued it for a while but it appears to be back and I'm OH so tempted to give in. This really helped my skin out, reducing redness and leaving it plump and silky smooth come morning. I've used a couple of Elemis products but this has been the best by far! I'll be honest, if I actually owned this I don't know if I'd be able to use it at all because it's just too darn pretty to spoil! The above image really doesn't do it justice, the mixtures of pink and coral and the shimmer...the shimmer, the shimmer! It's more like a piece of art than a beauty product! I also love their luxe packaging! OK, so it might be the cheapest thing on the list, making it seem a little less high end than the other products here but, I generally pick my body wash up for under £3 - so £18 is way out of my minimum wage price range! I got a sample of this a while ago and it was so foamy and luxurious! It smelt heavenly and made my bathroom feel like a luxurious hotel room. Yes, a shower gel can do just that! I have always wondered just what the hype - and the price tag, are all about when it comes to Creme De La Mer. I would love to bag myself a pot and found out (and of course share it with all you lovely people!) but alas, this is nowhere in my near future! I could never justify spending £105 on a moisturiser when my current one costs under £10! I'd be too terrified to use it! If you've been around the blog over the last couple of weeks you'll know I've recently fell in love with Lancome skin care - especially Visionnaire. I received a sample with my Clarisonic and it worked absolute magic on my skin - I miss it terribly! I tried to find a dupe but it just didn't work out as well as I hoped it would! I'd love to treat myself to a full sized bottle one day! If I was ever to purchase all the goodies on the list then they all deserve a case equally as luxurious to be kept in - and what's more luxurious than a Mulberry? Ah, a girl can dream can't she? 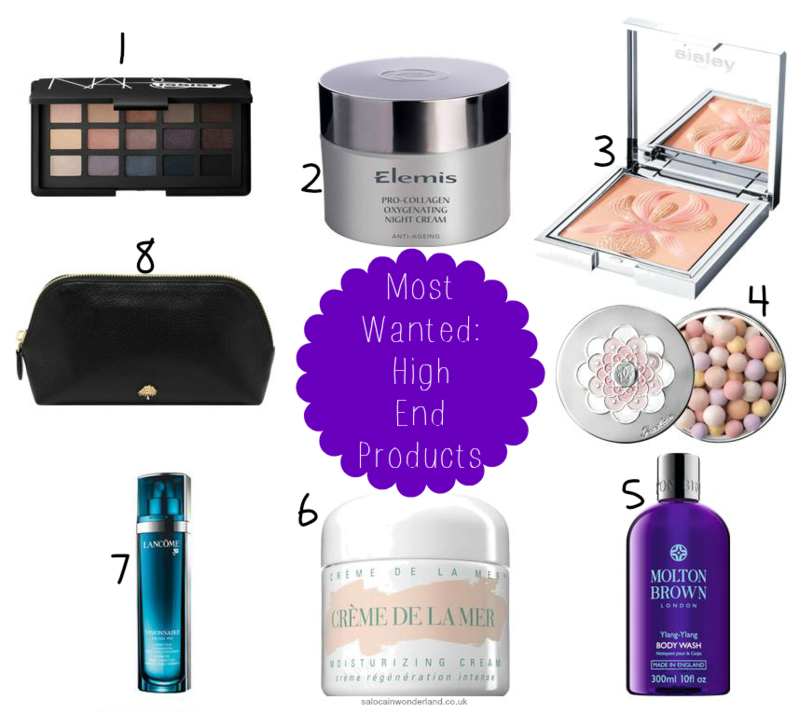 So what would you all put on your must have high end products list? I'd highly recommend trying Visionnaire out if you can! I'm pretty sure the Lancome counter will have sample sizes but I've no idea what conversation to start to try and bag myself some! I forgot about Nars Laguna bronzer!I pretty much want everything Nars now I think about it lol! Agree about the body wash too, I'd say £18 or $30 is a lot too! I'd like to say I won the lottery last night and have since ran out and purchased all these goodies - unfortunately I forgot t buy a damn ticket! Oh well, better luck next time I guess! I'm in love with the Guerlain pearls, though I wonder if we're paying more for the oh so pretty packaging than the pearls themselves? Me too! It just looks so pretty and magical! My side table NEEDS that sitting on it hehe! I lust over so many - I actually think if I was ever to get my hands on them I'd be too scared to use them in case the day came where they ran out! Nice post! Just like how you haven/t got these products because of price, me too. ;) I recently got into Aveeno skincare, and that was a bit above my usual price range but, yeah, that's it. I've seen some Aveeno skin care products in Home Bargains so if you have one local you might want to check it out! I'm heading over to your blog now - see you there! Me either! I thought it would have been closer to the Urban decay naked palette price, I was really surprised - it made Naked 3 look more affordable! Those blushes are just too pretty! I don't know if I'd be brave enough to ruin them with use! Love the smokey Nars eye shadow... wonder if it rivals the Urban Decay palette? Ooo I'd love to have the mean to find that out myself but I'll have to resort to Google I think! Shame! There are some lovely looking products here! Guerlian is a high end brand that I've been lusting after trying recently - the only problem is that their products look far too beautiful to ever use! I know what you mean! I'd want to keep them as perfect and pretty as they are, can't imagine ruining them with use!